Tuesday, more than 100,000 Rhode Islanders will vote in the Democratic and Republican Primaries. For the first time, a photo ID will be required – although it is important to note that all voters – with ID or not – will be allowed to vote. Confused? Don’t be. 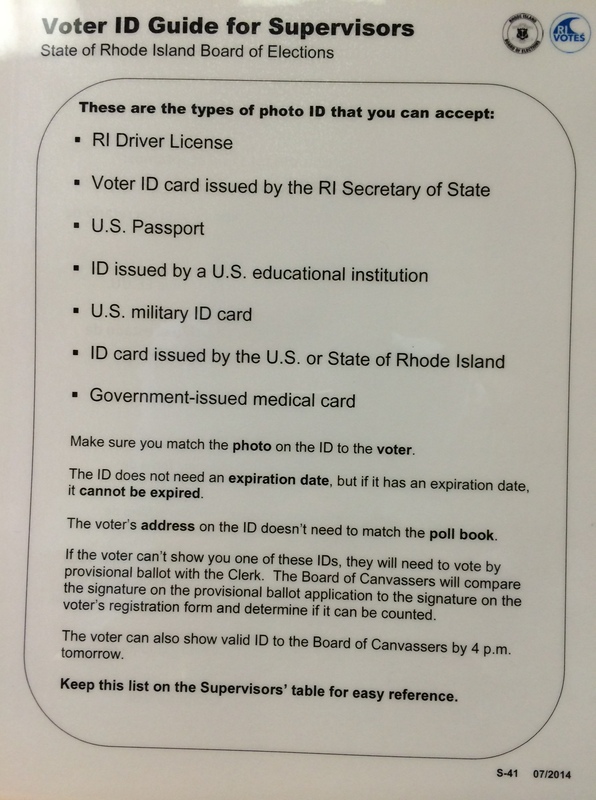 Voters who do not bring a Photo ID can still vote using a Provisional Ballot. The voter can then check the status of their provisional ballot and whether the Board of Canvassers approved or rejected his or her ballot here. The ballot should be counted if the signature he or she gives at the polling place matches the signature on the voter registration card. 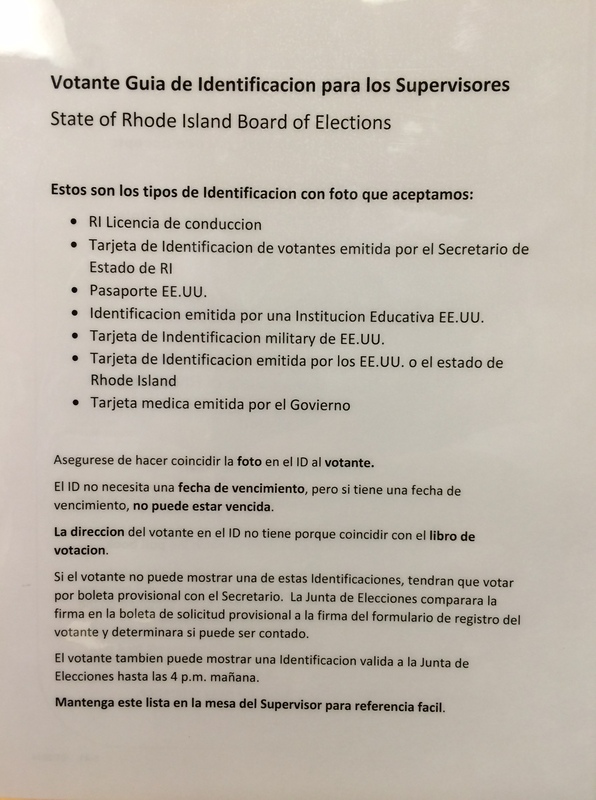 Here is a list of the acceptable forms of photo ID in English and in Spanish. Voters can also check their polling location and view a sample ballot here. The New York Times today reviewed the state of the law regarding the legality of law enforcement searches of cell phones without warrants today. The issue will attract attention on Thursday when a Senate committee considers limited changes to the Electronic Communications Privacy Act, a 1986 law that regulates how the government can monitor digital communications. Courts have used it to permit warrantless surveillance of certain kinds of cellphone data. A proposed amendment would require the police to obtain a warrant to search e-mail, no matter how old it was, updating a provision that currently allows warrantless searches of e-mails more than 180 days old. Recently, in Rhode Island, in the case of State v. Patino, C.A. No. 10-1155, Rhode Island Superior Court Judge Judith C. Savage ruled that Michael Patino, a man accused of the 2009 killing of his girlfriend’s 6-year-old son, (1) had a reasonable expectation of privacy in his text messages and (2) that evidence from his cell phone was collected illegally, before police obtained search warrants. The Court also ruled that because of the illegal search, almost all the evidence obtained by police – including the text messages, all cell phones and their contents, all cell phone records, and critical portions of the Defendant‘s videotaped statement and his written statement given to the police – was tainted and could not be used at trial. “Cell phones have replaced telephones. People send and receive billions of text messages to and from their cell phones daily. Text messaging, especially among young adults, has become an oft-employed substitute for face-to-face conversations, cell phone conversations, or email. Accordingly, this court finds that it is objectively reasonable for people to expect the contents of their electronic text messages to remain private. Toyota has expanded the recall of several models of cars troubled by uncontrolled acceleration (see full list of recalls here). The recall now includes 2.3 million vehicles including the popular Camry and Corolla models. The Wall Street Journal reports that attorneys across the country are hearing from Toyota owners regarding accidents, injuries, deaths or fears regarding their cars. Some are complaining of economic damages from a decline in their car’s resale value. Some experts say they expect Toyota to settle suits. If you are have had been injured as a result of a stuck accelerator pedal in a recalled Toyota vehicle, contact a lawyer today. What it is: The hotly anticipated collaboration platform that allows users to share and edit documents, and upload pictures and videos remotely in a real-time format. For example, if you are looking to draft a complaint, you could upload it to a Wave (structured like a new Gmail message), allowing associates and clients to view or comment on it, rather than saving a new document each time. The Wave also allows real-time messaging. What it is: A free publication search tool featuring legal opinions. Users may search by case name, court, citation and topics. What it is: An add-on to the Google Maps feature that allows a small law firm or other business to upload a short blurb about its firm and coordinate contact information into a Google search. If a potential client wants a medical-malpractice attorney in Beverly, for example, he could search those terms and find information about your firm and other relevant ones. Earlier this week, Rhode Island Attorney General Patrick Lynch launched a new campaign web site, www.lynch2010.com. The new site solidifies his entrance into the race for Governor: a field that currently includes General Treasurer Frank Caprio (D) as well as former US Senator Lincoln Chafee (I) and perennial candidate Bob Healey (I). Former Cranston Mayor Steve Laffey is also rumored to be building a campaign. The newly formed Moderate Party is also expected to field a candidate. Ever wonder whether if the FBI or the Department of Homeland Security keeps a file of you? FBI File – In order to get a copy of your Federal Bureau of Investigation file, click here to view instructions for filing a request (which must be notarized) pursuant to the Freedom of Information Act. If the file is under 50 pages, there is no charge to send it to you. Your Homeland Security File : Since the Department of Homeland Security has files on many frequent international travelers, you may want to request a copy of your file. Click here to find out how.